Japanese Knotweed is among the most feared invasive weeds, because of its effects on real estate values, taxes and infrastructure; it is unfortunately able to damage all three – it damages property values merely by being there, raises taxes by increasing municipal costs, and damages infrastructure by invading foundations, pavements and pipes and then expanding its operations. About a year ago, the City of Rossland introduced a bylaw requiring property owners to ensure that their land is cleared of, and kept clear of knotweeds. At the same time, Council agreed to provide financial assistance for ridding properties of knotweed. If you have anything resembling knotweed on your property, you can contact Central Kootenay Invasive Species Society (“CKISS”) to find out if it is the dreaded knotweed or just a relatively harmless look-alike form of bamboo. If it is an invasive knotweed, you can find an application form here to apply for financial assistance. The trick is to catch the stuff early on, before it becomes a large and spreading menace that costs a lot to eradicate. CKISS has now lauded Rossland as the local leader in acting to control and stop the spread of knotweeds. 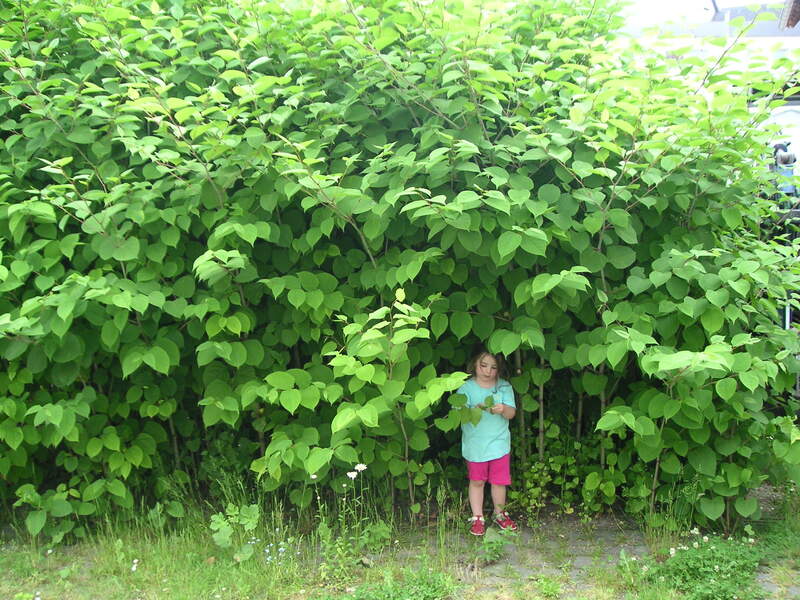 “Knotweed is listed as a priority species for the Province of BC and the Central Kootenay Invasive Species Society (CKISS). We applaud the efforts of the City of Rossland for being the first municipality to take firm action on knotweed eradication. Our hope is that other municipalities in our region follow their lead,” said Erin Bates, CKISS Operations Program Coordinator. There was a particularly large and vigorous patch of knotweed growing on the bank behind Rossland’s Public Works Yard, which has been treated, and judging by the flourishing frond growing tall from low down on the bank this summer, still needs more treatment. Now, if you have no Japanese Knotweed, give yourself one pat on the back. But if you’re hosting Spotted Knapweed, Common Tansy, Hoary Alyssum, Burdock, Scotch Broom, Policeman’s Helmet (also known as Himalayan Balsam), Orange Hawkweed or Yellow Hawkweed, better get out the gloves and weed-up-rooting implements and plastic bags to gather them up for disposal -- for next spring; be prepared. These are also among the worst invasives in our area, and they’re rapidly taking over large swaths of territory.